At Fort Worth Cosmetic & Family Dentistry, we can provide a wide range of dental services. We can typically provide every type of dental service without having to refer you to other specialists. This flexibility saves you time and keeps your total dental care within one practice. Our emphasis is on total preventive care for our patients. Total care begins with regular hygiene visits, regular checkups and continued home oral health routines. Use a toothbrush with soft bristles and a small strip of fluoride toothpaste. When you brush your teeth, move the brush in small circular motions to reach food particles that may be under your gum line. Hold the toothbrush at an angle and brush slowly and carefully, covering all areas between teeth and the surface of each tooth. It will take you several minutes to thoroughly brush your teeth. Brush up on the lower teeth, down on the upper teeth and the outside, inside and chewing surface of all of your front and back teeth. Brush your tongue before you rinse. Dental caries, or tooth decay, is a common and preventable disease. While caries might not endanger your life, it may negatively impact your quality of life. When your teeth and gums are consistently exposed to large amounts of starches and sugars, acids may form that begin to eat away at tooth enamel. Carbohydrate-rich foods such as candy, cookies, soft drinks and even fruit juices leave deposits on your teeth. Those deposits bond with the bacteria that normally survive in your mouth and form plaque. The combination of deposits and plaque creates acid that can damage the mineral structure of teeth, with tooth decay resulting. Fillings are used to replace and restore your tooth structure that is damaged due to decay or fracture. We will replace old, broken-down amalgam/metal fillings that contain traces of mercury with white fillings (composites), or tooth colored fillings, to restore your smile and teeth to a more natural look and feel. With today’s advancements, no longer will you have to suffer the embarrassment of unsightly and unhealthy silver/mercury fillings or metal margins of the past. Eliminate the dark, black appearance in your teeth with new-age, cutting edge, tooth-colored resin or porcelain materials. In recent years, the bacterial inflammation involved in gum disease has been linked to chronic health problems like stroke, coronary artery disease, and premature, low birth weight babies. Our doctors and hygienists take great care to identify and treat gum disease early to keep you and your mouth healthy. Gum disease or periodontal disease can cause inflammation, tooth loss, and bone damage. Gum disease begins with a sticky film of bacteria called plaque. Gums in the early stage of disease, or gingivitis, can bleed easily and become red and swollen. As the disease progresses to periodontitis, teeth may fall out or need to be removed by a dentist. Gum disease is highly preventable and can usually be avoided by daily brushing and flossing. One indicator of gum disease is consistent bad breath or a bad taste in the mouth. Periodontal simply means “the tissue around the teeth.” Periodontists specialize in the treatment and surgery of this area, which is often characterized by gum disease. Plaque is the most common element causing gum disease. Unfortunately, periodontal problems are often discovered after they have persisted for an extended period of time. 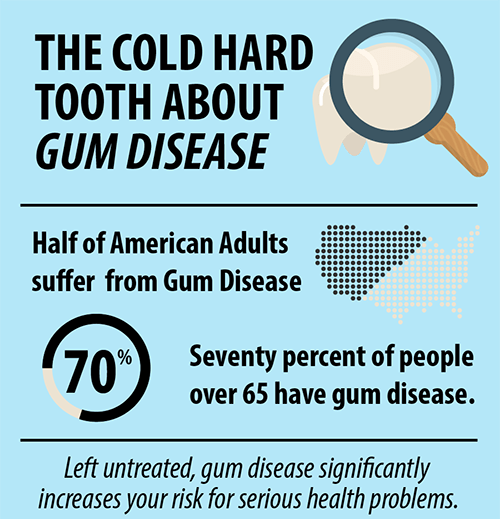 Proper oral hygiene, daily dental care, and regular dental checkups will minimize the risk of gum disease. Gum disease ranges from mild (gingivitis) to moderate or severe (periodontitis). Treatments are available for every case of gum disease. Click the image above to view a larger, uncropped version. Your Fort Worth dentist is in a unique position to detect and diagnose oral cancer in the early stages, before it progresses into a deadly condition. Early diagnosis and treatment is essential to ensure the best chance at survival and recovery. While you only see your regular doctor when a problem arises, you should see your dentist twice every year. We are always on the lookout for any changes or abnormalities that may be signs of oral cancer, and you should be on the lookout for these things at home as well, especially if you fall into any of the high risk categories. At Fort Worth Cosmetic & Family Dentistry, we care deeply about the health and wellbeing of our patients. That’s why we’ve invested in a high-tech oral cancer screening device that allows us to illuminate minor tissue abnormalities before they become visible to the naked eye. With OralID™, we can detect oral cancer sooner, so you can treat it right away before it progresses. You should talk to your Fort Worth dentist if you experience any sensitivity and we can help remedy it for you. Daily brushing and flossing help to prevent the buildup of food particles, plaque, and bacteria in your mouth. Food particles left in the mouth deteriorate and cause bad breath. While certain foods, such as garlic or anchovies, may create temporary bad breath, consistent bad breath may be a sign of gum disease or another dental problem. If you experience persistent bad breath, you should talk to your dentist in Fort Worth to see how we can help. You should let us know if you have problems with canker sores and we will give you our best advice for treating them. If you have any questions about general dentistry or would like to schedule a visit with your Fort Worth dentist, Dr. Nikki Green, Dr. Robert Leedy, or Dr. Omar Gabr at Fort Worth Cosmetic & Family Dentistry, give us a call today or request an appointment online!